Enjoy your latte with skim milk. Will knowing Starbucks nutrition facts mean you'll have to cut out your daily latte? Here's some information about what's really in those coffee treats, sugary pastries, breakfast sandwiches and other goodies. If you haven't been to Starbucks in a while, you might be surprised at the current offerings. In addition to coffee concoctions, you'll find fresh sandwiches, yogurt parfaits, fruit plates, and of course scones and other pastries. Many Starbucks shops get their pastries from local suppliers. That means that your shop might have options a little different from a Starbucks in another state, or even in a nearby town. No matter where you are, though, you'll notice a relatively new attention to serving attractive, tasty food. Since the stores use local suppliers, nutrition facts for foods vary according to location. At the Starbucks web site, you can enter your zip code and then click on the store nearest you. You'll find a detailed list of local Starbucks nutrition facts for the food products they carry. A cup of black coffee is nearly calorie-free, but how many of us stick to black coffee? Once you start adding cream and sugar, the calories go up. In fact, the drinks the barista mixes for you can pack a whole meal's worth of calories and fat. Tall cappuccino with whole milk: 120 calories. Go for skim to get it down to 80 calories and zero fat. Tall café latte with whole milk: 200 calories, with 100 from fat. With skim, it's only 120 calories and fat-free. Tall caramel macchiato, whole milk: 240 calories. Keep the caramel topping but switch to nonfat milk and it's 170 calories, with only 5 from fat. If you're watching your calories, you may not have to cut out these treats entirely. 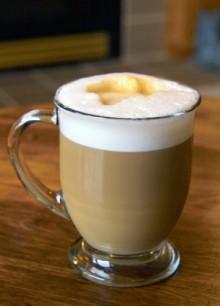 Coffee drinks made with a generous amount of milk can have 30 percent or more of your daily requirement of calcium. You'll also get some of the Vitamin A you need. If you choose Starbucks' Tazo teas, you can enjoy a warm, comforting drink without any calories at all. Once again, as soon as you start mixing it the way you like it, you'll need to keep an eye on the milk, sugar, and other additions. Tall Tazo tea with lemonade: 90 calories. Tall Tazo chai tea latte with whole milk: 210 calories, 45 from fat. Tall Tazo red tea latte, whole milk: 170 calories, 45 from fat. A Frappuccino is a delightful treat on a hot day. It's just coffee, right? It's not like having an ice cream cone. Except… it sort of is. A tall coffee Frappuccino is probably the best choice for dieters who crave a creamy, icy treat, with 190 calories and only 15 percent of your recommended daily calcium. Go for a mocha Frappuccino with that yummy whipped cream and you're looking at 310 calories, more than a third of them from fat. What if you're really thirsty? Try a grande Caramel Frappuccino and you may as well skip dinner: it's 530 calories.Luckily, Starbucks has an option for people who are watching their waistlines: Frappuccino Light. The Light version of that fabulous grande Caramel Frappuccino is 380 calories, with 130 from fat and still 15 percent of your daily calcium. Skip the whipped cream and get the fat calories down to 20, with 250 calories for the whole yummy treat. On the Starbucks web site, you'll also find details on sodium content, other vitamins, total carbohydrates, fiber, and the different types of fat. Click on "Nutrition Information" and go to "Beverages." You'll be taken to a detailed page with all the different drinks: coffee, tea, juice, hot chocolate, cider, and more. You can choose whole, nonfat, or soy milk, and decide whether or not you'll have the whipped cream. Look near the top of the main beverage page for a little link marked "compare all Starbucks beverages." It will bring up a chart with all the different drinks and their nutrition information, so you can compare them side by side. One thing you won't find is the ingredients. That's certainly understandable; Starbucks makes their money off their delicious recipes. However, it can be a little frustrating if you have allergies or other dietary concerns and need to know exactly what's in the drinks. Try asking the barista at your local shop, or contact Starbucks directly through their web site.